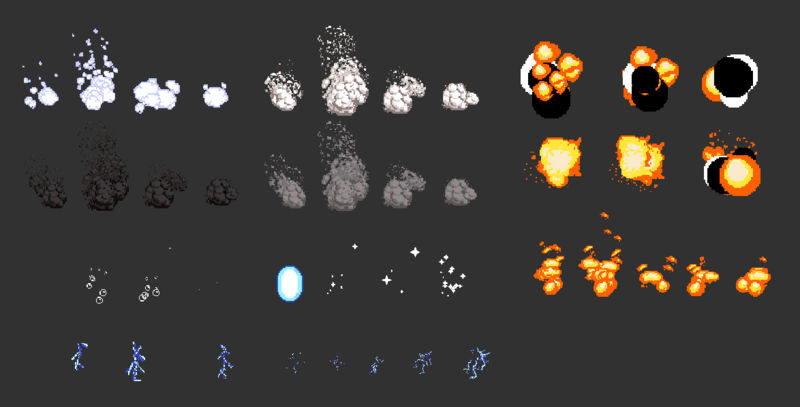 Contains 48 pixel art style particle systems (Shuriken). Can be used in both 2D and 3D projects and easily customized. Just drag and drop the prefabs into your scenes! Also available at the Unity Asset Store. Unity .unitypackage file requires Unity 5.5 or later. License info: Asset Store Terms of Service and EULA. Basically you can use them in any project you want, commercial or not, but you can't resell them as just assets (as I'm doing here). I'm interested in the art assets, but I do not use unity. Can you include PNGs in the asset pack, perhaps with some gifs to show how they can be used together to form particles? 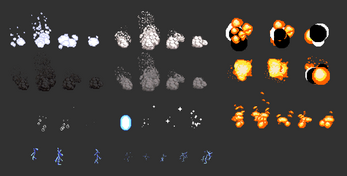 Hello, PNG files for every art asset are included, they are simple 32x32 4 frame or 8 frame spritesheets. You just need to animate them as you wish, you may even create new effects. The particles themselves are those same animations, but with added rotation, bursts, effects, etc. Are you able to upload this as a zip with separate PNGs? A .unitypackage requires unity. Sure, let me do that today. Great idea. May I email you a free code for the pack (itch is missing a private message feature)? If you can test how well it can be used outside Unity and post back a comment that would be great! The PNGs worked great with GameMaker's particle system. Thanks for providing a zip!